One day your kid is lying on the floor of a surf shop exclaiming, "This store is killing me," and seemingly in a blink of an eye they're graduating from college. In between there were ups: a nearly perfect SAT score, Rodman Scholarship and downs: public vomiting in Costco and the Haleikulani (neither alcohol-induced--she was 5 years old). The soundtrack changed from Sporty Spice and Pickle Trough to the Mountain Goats and Astronautilis. The diet included 5 (long!) years of vegetarianism, pepperoncini juice and boiled silkworm larvae. The end result is one of the most intelligent, well-rounded people I have had the pleasure of knowing, and certainly one of the only ones I actually had a part in making. How could I refuse a request for Momofuku Milk Bar's carrot cake and grapefruit pie for the graduation festivities? It wouldn't be Milk Bar without a kitchenful of dishes and trips to 3 separate grocery stores. I should have gone with my gut and hit Korean Korner first. They came through with the passion fruit puree--freezer section, last package, labeled as "curuba". Thank God for smartphones. If you have somebody deserving of adulation, the recipe for the pie is here. Do yourself a favor and make a little additional Ritz crumb because I find I never have enough with those recipes. 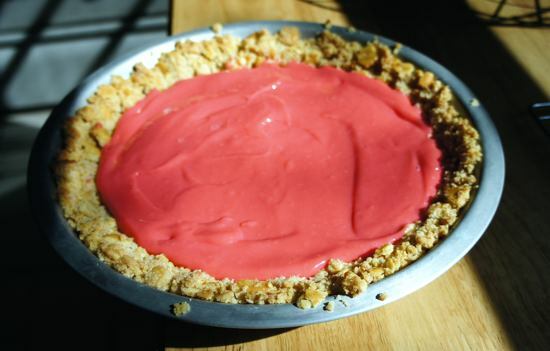 I put too much red food coloring into the topping. The carrot cake recipe is actually five separate recipes, probably more trouble than most are willing to go through even for their brilliant first-born. We will get a picture of the finished product, and I will tell you if it was worth all the trouble. I licked blobs of the various components off spoons during the creation and I can vouch that if the sum is greater than its parts it will be celestial.